The Kasilof River is another very popular fly fishing destination in the Kenai Peninsula of Alaska. People come to the various Alaskan rivers from all over the world to catch the large Salmon that run these rivers each year. The Fly fishing can be amazing during these salmon river runs, and the season is short so you need to plan your trip early while guides are still available and the lodges still have accommodations available. There are many Alaskan river fishing guides, fishing charters, and fly fishing lodges available to choose from. Salmon fly fishing a very popular sport in the state, and many people travel to the many salmon filled streams every year. If you have never fly fished for salmon you do not know what you are missing. Why not give a fly fishing vacation a try? The Kasilof River begins at Tustumena Lake and flows westward about 15 miles to the Cook Inlet. This river is most known for the great King (Chinook) Salmon runs that begin in May and run through June. These glacial waters provide clear water and all the nutrients needed for the fish that call this river home. Although this river is not as well known as the Kenai River, many feel this river is a much better place to fish. There is much less fishing pressure on this river and the catch and release rules are more favorable to the angler of the Kasilof by allowing continued fishing after keeping one King. You must stop on the Kenai. The King Salmon runs begin in May, these are mostly hatchery fish returning up river a few miles to Crooked Creek. These Kings are typically 15-20 pounds but you will find some in the 35 pound range from time to time. 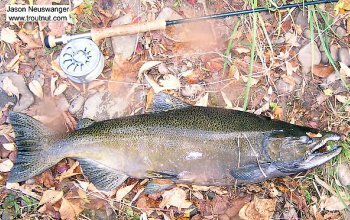 The second run of King Salmon begin in late June and peak the third week of July. These Salmon average 30 pounds but many will tip the scales over 50 pounds. In July the water will get much faster and higher with the melting of the Tustumena Glacier. 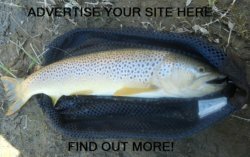 This gives the fish a much needed advantage and will provide the fly fisherman an experience like no other. The Silver Salmon runs begin in early August and last throughout the month. The Kasilof is a great destination for a fly fishing vacation and when you compare it to some of the other rivers in Alaska you will see that it is among the best places to fish. There are many Alaska fishing guides in the area that would see to it that you have a great experience. Leave the Kasilof River and go to the Alaska page.